Black Friday Sale! Avail 40% off when you Book for Themed Soccer Camp. when you book your Themed Soccer Camp now! 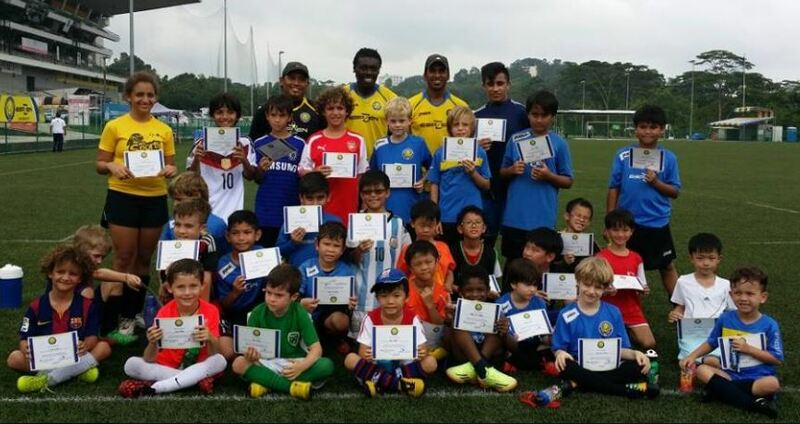 ESPZEN Soccer School provided an amazing soccer camp experience to over 450 children in Singapore in 2017, and we will be organising our Summer Holiday Camp. 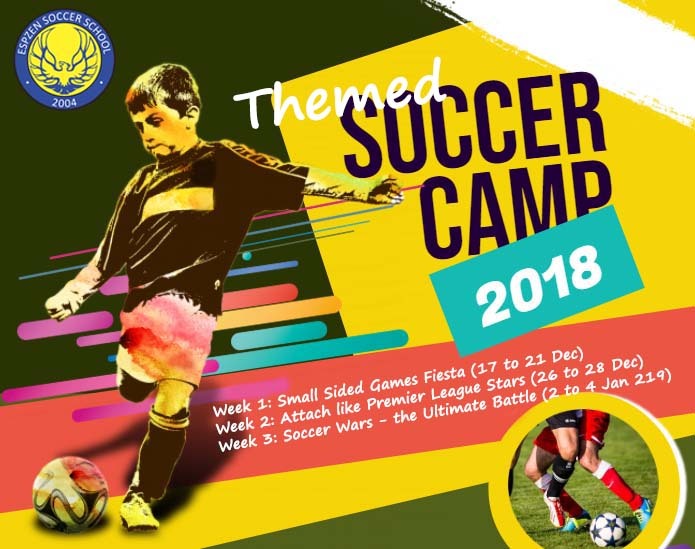 Our camps take place for 3 weeks from 17 Dec 2018 to 4 Jan 2019, in this fantastic facility at Turf City from 9:00am to 12:00NN and 1:00pm to 4:00pm. Parents may sign up their child for morning or afternoon sessions, or full day sessions. BLACK FRIDAY SALE! Book and pay by Friday, 23rd Nov 2018 and avail of 40% off your camp fee. Minimum 3 days sign up. ESPZEN Soccer School has developed soccer camps for all ages, skill levels and experiences playing soccer. ESPZEN coaches have been handpicked for their experience, knowledge, passion, and enthusiasm and will encourage children of all abilities to believe in themselves, share their experiences with their new made friends, and have lots of fun. 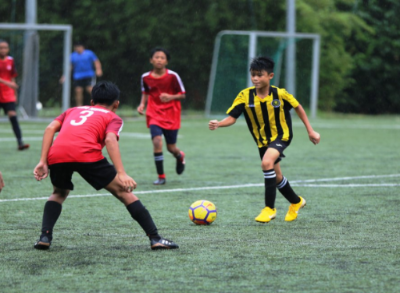 All coaches are AFC, English FA or UEFA qualified and ESPZEN operates a strict 1:12 coach to student ratio ensuring your child will receive quality coach interaction and will not be "lost in the crowd". All ESPZEN Soccer Camps are conditioned to the developmental age of the participant. Programmes will be challenging but achievable, ensuring that each child leaves our camp with a raised self-esteem and most importantly having experienced fun and enjoyment. ESPZEN's coaches are the heart and soul of our programs and we pride ourselves on the quality of our coaches. Each is hand-picked for their knowledge, personality and exceptional coaching ability. All our coaches are fully licensed by either the Union of European Football Associations (UEFA), the English Football Association (The FA) or the Asian Football Confederation (AFC), supplemented with dedicated youth football qualifications from Coerver Coaching or the English FA, and all our coaches of course hold a valid first aid /emergency first aid certificate. Football is the most exciting game in the world, our coaches are passionate and love the game, this enthusiasm underpins all of our sessions, ensuring every child they engage with is motivated and inspired. Boasting the strongest coaching team in Singapore, ESPZEN continues to recruit the highest quality coaches from elite academies and is led by Dennis Ikogho (AFC B Licensed coach), Itimi Dickson (former Singapore National Team Player and AFC Licensed Coach), Lee Taylor (English FA Youth Coach), Muhammad Arif Bin Abdul Rahman (AFC C Licensed Coach) and Blaine McKenna (UEFA B Licensed Coach) . Coaches deliver professional youth academy sessions, to holistically develop young players in their technical, tactical, physical, social and mental attributes. The coaches create an environment where young players, are encouraged to be creative and expressive in their play, and are confident to experiment with their skills and techniques during games and game related practices.